The past few weeks have been a busy few weeks. I got a job as assistant manager at a chocolate shop on the 25th of June and since then all I seem to be doing is working (and eating chocolate). As soon as I come home all I want to do is eat and go to bed. I am still working on finding that happy medium between work and sleep. I suppose being unemployed for six months does that to you though. Hopefully my energy will come back soon! 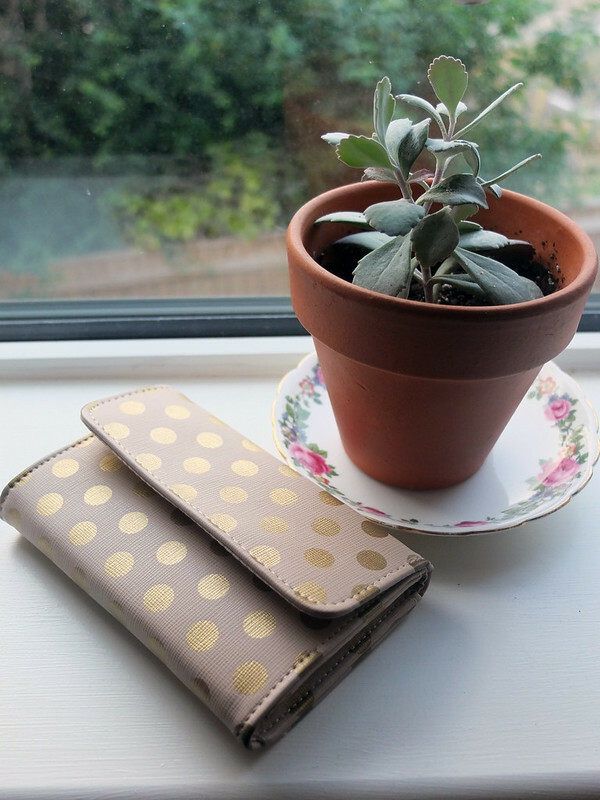 I bought this lovely little golden spotted purse in Topshop on my lunch break today, at £5 I couldn’t resist! I took it to the till and as it was scanned it came up as being £3. I love it when that happens. And now my boyfriend can’t complain that I have the most disorganised purse in history. There are pockets for everything in here! This cat print dress was £1.95 from a charity shop. The zip catches a bit and had to be sewn half way up because it had been broken, but it’s worth it. I still looks lovely on, and once I get some more free time I think I’ll completely take the zip out and start again. Ah, the beauty of the birthday gift voucher! I bought this from accessorize. I had been eyeing it up for a couple of weeks and then noticed that it had been put in the sale at half price for £14. And just like that, my voucher was spent. It has a very 50’s vibe to it, without being too overkill. I can’t wait to wear it when I holiday in Carcassonne this September. Dungarees, the summer staple that I’ve been looking for. I found these when visiting Cambridge for the day with my boyfriend and mum. (We were viewing houses, but that’s a story for another day.) I had just been paid, and at £12 I couldn’t help myself. I think I’ve worn them almost every day since I bought them.